Boasting of a rich history, the spectacular city of Nellore lies in Andhra Pradesh. Renowned for its devout legacy, the city fascinates people with the best infrastructure in the state. In fact, it is the most speedily budding cityscape of Andhra Pradesh. With the history of being ruled by various dynasties, it proudly swanks a rich past. In fact, the influence of all the dynasties which ruled this town can be seen in the architecture of temples and other structures housed here. 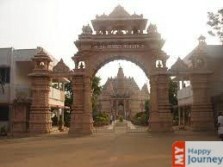 Apart from being famous for its large number of temples, this city is also a popular center of commerce and agriculture. The principle attraction of this great city is Sri Ranganathaswamy temple. This 600 year old temple is renowned for its Gaaligopuram, which is about 70 feet tall. The seven gold plated Kalisams sited on the top of Gaaligopuram add to the magnificence and grandeur of the temple. Apart from this, Nellore is the house of many other ancient temples as well. Nellore is a place which is surrounded by a large number of natural retreats; Mypadu Beach and Lake Pulicat are the main ones. Nelapattu Bird Sanctuary is also located nearby and it is a delightful place which has some rare species of birds. If you are looking to spend some pleasant moments with your loved ones, then Somasila is an ideal location. A popular picnic spot, it offers calm and peaceful atmosphere, which can make your trip an unforgettable one.